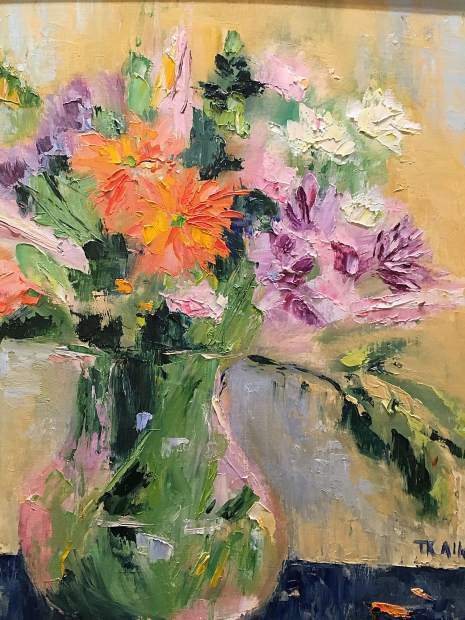 "Floral in a Pink Vase," by Terri Allender. What: “Still Life,” an exhibit of the Vail Valley Art Guild. When: Gallery holiday hours are noon to 5 p.m. daily; the gallery is closed Christmas Day, Dec. 25. Where: Art of the Valley Gallery, 240 Chapel Square, between Pinecones and the Nest, Avon. AVON — Art of the Valley Gallery is currently showing “Still Life,” an exhibit featuring the work of Vail Valley Art Guild artists Sherri Wilson, Melissa MacDonald Nelson, Terri Allender, Becky Kieler and Barbara Holden, who each have a unique style. In addition to the current exhibit, the gallery has also named Patti Dixon as the featured artist for the month of December. Dixon is the principle of Patti Dixon Design in Edwards, specializing in interior design. Her large, vibrant abstract art is “just plain fun as it manifests great joy and peace,” she said. Often working in vivid primary colors, Dixon’s paintings light up a room. Complementing her art are Bob Will’s dynamic sculptures of wood, metal and minerals, made in his Red Cliff Studio. The gallery’s holiday show, “Tis the Season,” also continues through the end of the month. Art of the Valley Gallery is an all-volunteer staffed gallery managed by the Vail Valley Art Guild, a nonprofit promoting visual arts in Eagle County. The gallery exclusively promotes the work of local artisans, and membership is available to artists of all levels, as well as friends of the arts. Oil painting classes and open studios are offered weekly, as well as workshops scheduled throughout the year in a variety of mediums. Stop by the gallery at Chapel Square in Avon to learn more about activities and rotating exhibits. Exhibits change monthly to accommodate the works of more than 190 guild members and include sculpture, ceramics, furniture, fiber art and photography, as well as pastel, oil and watercolors.